Eating on the run has alot to answer for in this modern world. The routine of sitting down to enjoy one solid meal every day is almost a treat for some people, not to mention families! Digestive help starts in our mouth. In the effort of chewing and the enzymatic process/Agni power that takes place is related to the joy of eating. The comfort of feeling full, taking our time to bits, taste, chew, and masticate our food so that the stomach can focus energy on the further digestive processes. “Your stomach doesn’t have teeth,” will ring a bell for some of you. With that reminder, from the Ayurvedic perspective, do you know how much one individual should chew and swallow at one sitting? 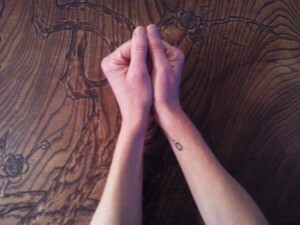 Well, place your hands together and make fists, as the picture shows. This gives an individual a pretty good idea of the size of their stomach. Digestive help is here with Ayurveda. Stomach size does not mean meal size! In Ayurveda there is the rule of three. One fist is for chewed food. And the other fist, imagine it split in two parts- one part is for space, and the other part is for tepid liquid during the meal. We need the space for the action of transformation in the stomach, and we need the liquid for lubrication. Food for thought for us all, those who over eat, and those who undereat. And in fairness most of us do a bit of each. Keeping it balanced is the most important.